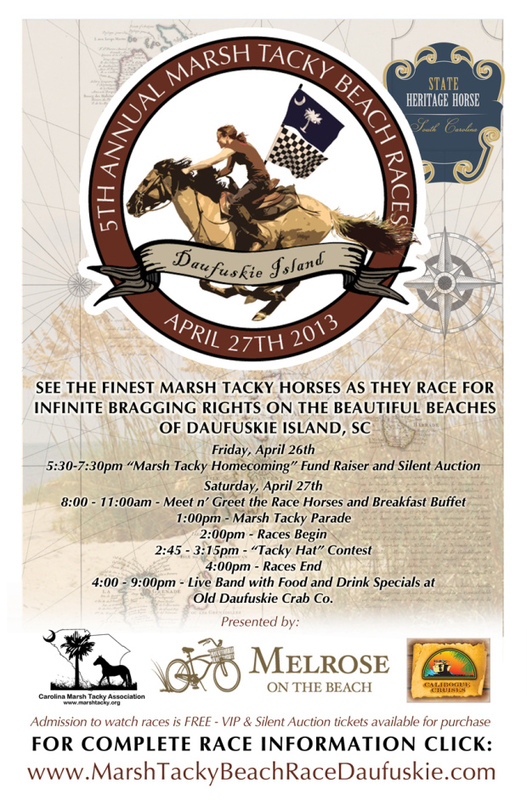 5th Annual Marsh Tacky Races on Daufuskie Island! The Carolina Marsh Tacky Association is pleased to announce that the annual Marsh Tacky beach race will be held on Daufuskie Island from 2:00 – 4:00 this coming Saturday, April 27, 2013. Registered horses will be allowed to compete in three classes on Daufuskie, mares, geldings and stallions. There will be no monetary prizes but winners will be awarded infinite bragging rights! In the past the races have been held on Hilton Head however this year the location has been moved to historic Daufuskie Island. Racing Marsh Tackies on the beach was once a wintertime tradition after each year’s harvest with the winner taking home bragging rights. The purpose of the race is to showcase an endangered breed of horse that once roamed the SC Sea Islands and coast by the thousands. 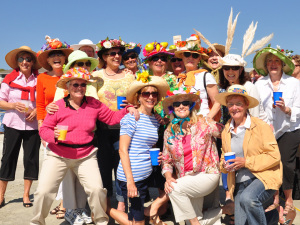 The racing is slated to begin at 2:00 with a “Tacky Hat Contest” to be held during race intermission between 2:45-3:15 at the race finish line. Competitors will be judged by audience applause in the categories of most beautiful, most original, and most tacky! Throughout the day, there will be food and drink specials, a selection of Daufuskie Island artisans’ work and merchandise for sale, entertainment and more. Check here for transportation to and from Daufuskie, it is a short boat ride from Hilton Head and is a one of a kind event that you don’t want to miss!